What Should I Know About Biomarkers for NSCLC? What Should I Know About NSCLC Biomarkers? Thanks to advances in scientific research, doctors now know that NSCLC has different subtypes. The specific type of NSCLC that you have may be the result of mutations, or changes, that occur in certain genes, which can affect the instructions for cells to grow and divide. Knowing if you have a genetic mutation associated with lung cancer is an important step when approaching your treatment plan and can help you and your care team determine the right course of action. One type of tumor biomarker is a molecule that indicates the presence of a change in a tumor cell’s genes that may be related to the development or spread of cancer. 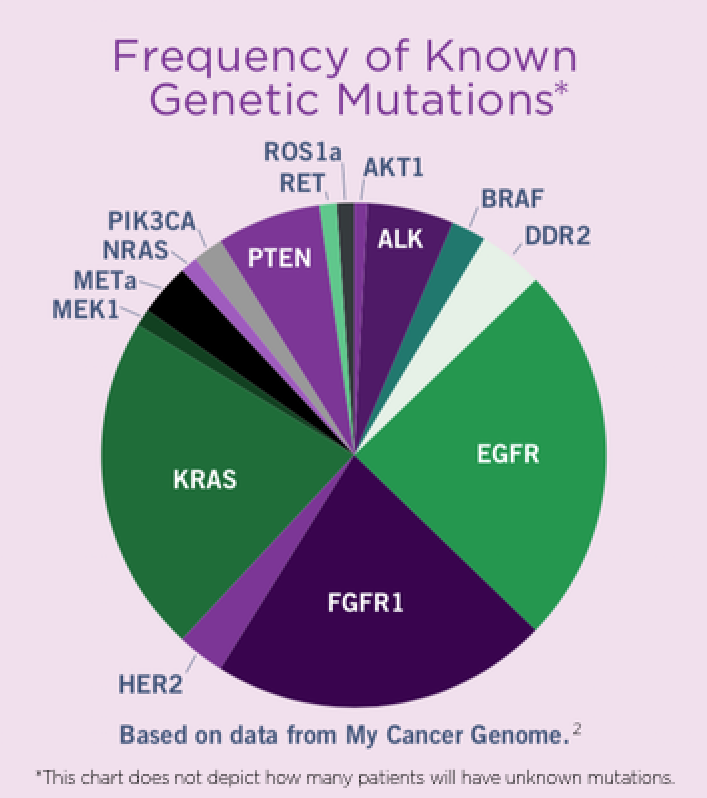 Another type of biomarker is the presence and level of certain proteins in tumor cells. Why is it important to know about biomarkers? What biomarkers exist for NSCLC? How do I know if my lung cancer has a biomarker? Get tested! Tissue from your tumor can be tested to determine if you have any of the known biomarkers. Ideally, you and your doctor should discuss biomarker testing before your first biopsy so that enough tissue is taken to perform the testing. If you already had a biopsy, ask your doctor to find out if enough tissue remains for biomarker testing. If not, you can ask your doctor about having additional tissue removed to test for biomarkers. Who should be tested for biomarkers? If you have been diagnosed with NSCLC, you should speak to your doctor about biomarker testing so that together you can decide what type of treatment may be best for your particular case. Not everybody with lung cancer can benefit from biomarker testing, so it is important to discuss why it may or may not be a good idea for you. Importantly, not everyone will test positive for a biomarker, and not every biomarker has an approved treatment option yet. What happens if my tumor tests positive for a biomarker? What if it doesn’t? By getting tested, you have taken an important step in managing your NSCLC. Click here to find questions to help guide a discussion with your doctor about your next steps. Click here to read what biomarker testing has meant for other patients. 1. Bailey A, Mao Y, Zeng J, et al. Implementation of Biomarker-Driven Cancer Therapy: Existing Tools and Remaining Gaps. Discov Med. 2014;17(92):101-114. 2. Lovly CM, Horn L. Molecular profiling of lung cancer. https://www.mycancergenome.org/content/disease/lung-cancer/. Accessed May 1, 2018. 3. Pao W, Miller VA. Epidermal growth factor receptor mutations, small-molecule kinase inhibitors, and non-small-cell lung cancer: current knowledge and future directions. J ClinOnc. 2005;23:2556-2568. 4. National Institutes of Health Website. Genetics home reference. http://ghr.nlm.nih.gov/gene/ALK/show/print. Accessed May 1, 2018. 5. Chiarle R, Voena C, Ambrogio C, et al. The anaplastic lymphoma kinase in the pathogenesis of cancer [review]. Nat Rev Cancer. 2008;8:11-23. 6. Garber K. ALK, lung cancer, and personalized therapy: portent of the future? J Natl Cancer Inst. 2010;102:672-675. 7. Gainor JF, Shaw AT. Novel targets in non-small cell lung cancer: ROS1 and RET fusions. Oncologist. 2013;18:865-875. 8. Litvak AM, Paik PK, Woo KM, et al. Clinical characteristics and course of 63 patients with BRAF mutant lung cancer. Journal of Thoracic Oncology. 2015;9(11):1669-1974. 9. American Lung Association. What you need to know about lung cancer tumor testing. http://www.lung.org/assets/documents/lung-cancer/interactive-library/what-you-need-to-know-about-tumor-testing.pdf. Accessed May 1, 2018.